Last week, the Gothenburg Port Authority launched a digital solution designed to make bunkering at the Energy Port easier and more efficient. The new ‘Bunkering App’ is one of the first in the world to offer this range of functionality. The Port of Gothenburg Energy Port is the largest open access energy port in the Nordic region, handling over 2,500 calls and more than 23 million tonnes of energy products each year. The Energy Port is also one of the world's larger bunkering hubs. 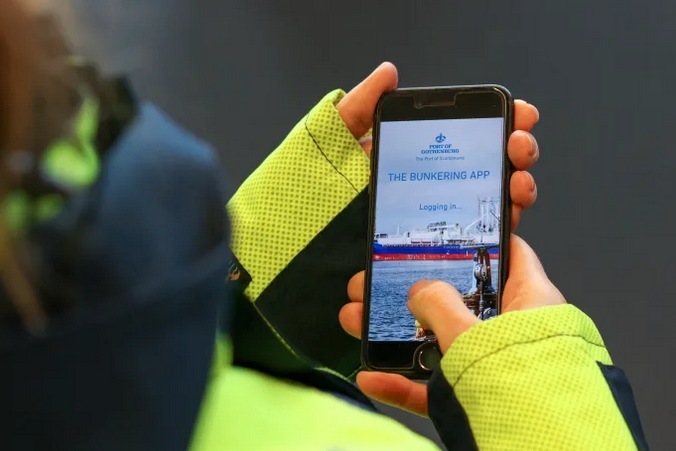 In an effort to make the bunkering procedures easier and more efficient, the Gothenburg Port Authority has developed the new ‘Bunkering App’. The app also compiles bunkering statistics, facilitating the work of the Swedish Maritime Administration Vessel Traffic Service (VTS) and other organisations at the port. The idea behind the app is to make it simpler for bunker operators to plan and carry out their work effectively. In January, a test period began with selected users contributing valuable input in the lead-up to the official rollout last week. The bunkering company Bunker One is one of the participating companies that now uses the app as part of its regular operations. “We are confident that using the app will help boost efficiency and maximise the use of our bunker quays. But we would like to point out that it is not our intention to use the app to replace daily contact with our customers, which will continue to be an important part of our relationship," said Dan-Erik Andersson, Head of Operations at the Energy Port. The bunkering app is a further key step in the endeavour to enhance digitalisation and automation at the Energy Port. An earlier example of this development is the new digital process control system (link for further details), which has streamlined pumping via the extensive pipeline network at the Energy Port. Development of digitalised work permits is currently under way, making coordination of operations at the Energy Port even more effective. efficient. Photo: Gothenburg Port Authority. The Port of Gothenburg is the largest port in the Nordic region. 30 per cent of Swedish foreign trade passes through the Port of Gothenburg as well as half of all container traffic. The Port of Gothenburg is the only port in Sweden with the capacity to receive the world's largest container vessels and has the broadest range of shipping routes within and outside Europe. The 25 rail shuttles that depart each day mean that companies throughout Sweden and Norway have a direct, environmentally smart link to the largest port in the Nordic region. The Port of Gothenburg has terminals for oil, cars, ro-ro, containers and passengers.